The spring spawning run on the Muskegon is well underway. Although none of us likes getting soaked with rain, the fact is that we need it to raise the river flow and to bring more steelhead upriver. Looks as if the weatherman is about to give us what we need (and maybe more) in the days to come. Stay tuned. Here, Bill poses a youngster that gave him way more of a tussle than he or we thought it could dish out given its modest size. Just goes to show that fish, too, apparently have temperaments; some fight, to be sure, but others like this guy, just won’t quit. Thanks guys for a most delightful day of fishing and conversation. I truly hope we can toss lines together again someday in the future on another steelhead trip. 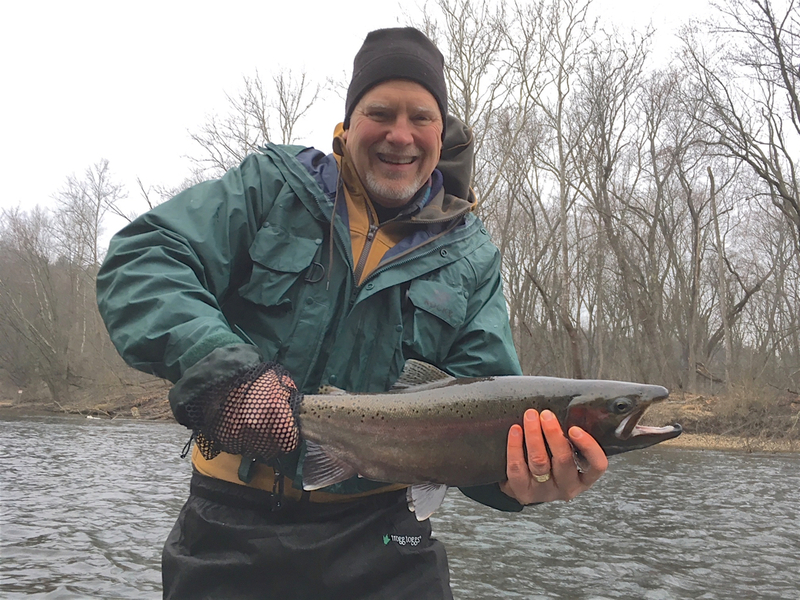 Prime Muskegon River Spring Steelhead Season is finally here in Michigan and we’re gearing up for a fantastic Spring Rainbow Trout Season and Spring Brown Trout Season! If you are looking to get out swinging flies on the Muskegon River this Spring with an Orvis endorsed guide who can help you find Spring Rainbow Trout, Spring Brown Trout or Spring Steelhead, we invite you to give us a call at (616)293-0501 to hear our open dates or visit our Contact Page for more information. While spots will fill quickly now that we are into April, some of the best weeks have availability today although they won’t last long! Be sure to visit our website Muskegon River Lodge for more information on our beautifully secluded, 12.5 acre wooded property with 400 feet of prime Muskegon River footage and incredible water views for our guests to enjoy, its own private chef and plenty of space for large groups. Visit RiverQuest Charters to find out more about our fly fishing charter services and our upcoming fly fishing seasons. And Follow Us on Facebook, Instagram or Twitter to see our most recent catches of Steelhead and Trout.